Where else can you PICK YOUR OWN APPLES, get lost in a CORN MAZE, feed the FARM ANIMALS and play all day on a GIANT PLAYGROUND? Only at Great Country Farms! 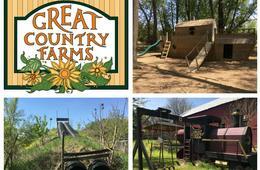 Located just 20 minutes west of Leesburg, VA, Great Country Farms grows fun! An Awesome Corn Maze PLUS 4 More Mazes! Amaaazing Apple Picking - $2.00 apple picking voucher is INCLUDED in this deal! EIGHT spectacular SLIDES, including an 80-ft. Triple Threat Slide & a 60-ft. Double Barrel Slide! See ya'll at Great Country Farms in September!! Voucher is valid Mondays - Fridays ONLY from September 3 - September 28, 2018. Includes Labor Day Monday (September 3, 2018). Includes $2.00 store voucher for apples - either pick-your-own or in the farm market. Hours: 9 a.m. - 6 p.m. Daily. All of the fun activities mentioned above are included in your admission. A voucher is required for all guests ages 3 and older. Children 2 and under FREE. Military ID holders and their immediate families are FREE. Not valid on Saturdays and Sundays. Not valid for School Tours or Farm Parties. Corn Maze opens September 1st and features a theme for Great County Farm's 25th Anniversary. Multiple vouchers may be purchased - and may be used at the same time for multiple members of your party. The Roosteraunt Concession Stand is open on Fridays from 11am - 4pm for lunch and hand-dipped ice cream! To Redeem: Please present your voucher for entry printed or on a smartphone. Questions? Need More Information? Please contact Great Country Farms at 540-554-2073. Valid only for the dates listed above. Multiple vouchers may be purchased and redeemed. Cannot be combined with any other special offers, promotions or discounts. Not valid on prior purchases. Vendor is responsible for the quality of the products or services provided at redemption. Operating hours are subject to change; check directly with vendor prior to visit.